Coastal zones and estuaries provide ecosystem services at local, national, and international levels. The sustainable provisioning of ecosystem services requires broadly impacting and costly regulatory actions, using available scientific resources. Gerardo Fragoso is currently working on factors controlling the growth and distribution of pioneering vascular plants in saltmarshes. He has been conducting experimental work, both at the coast of North Norfolk, UK; and in a flooding system built in the University's Botanic Gardens. His work aims to further our understanding of the processes involved in the formation of saltmarshes, and to inform the design of guidelines for the conservation, restoration and management of these environments. Kristian Teleki is currently completing the examination of regional and community ecosystem dynamics in the coral reefs of the Caribbean and in the Archipelago de Los Canarreos, Cuba. His thesis examines the change in these systems through time and what influence anthropogenic and natural disturbances have had on the biodiversity and architecture of coral reefs in the area. This is with a view to understand the dynamics of response and stability in these spatially and temporally variable ecosystems, as well as to enhance current management strategies of this environment. Hennie Schans started her Ph.D. in October 1998. She investigates the spatial variability of beach morphology and processes along the coast of East Anglia on large spatial scales (kilometres) on annual to bi-annual time scales. In particular, this study will emphasise pattern recognition, trend detection and parameterisation of forcing conditions. Possible links between the short-term (annual) and the long-term (decadal) changes in coastline morphology will also be identified. The findings of her thesis will improve the scientific basis of shoreline management plans, and will contribute to the understanding of the shoreline dynamics that characterise East Anglia and perhaps the wider southern North Sea basin. James Brown started his Ph.D. in October 1999. His research focuses on the risk to the English East Coast to flooding. The combined effect of storm surge and high tide is one of the largest risks to which human settlements on the East Coast are exposed. 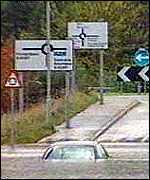 Previous attempts to model coastal flooding have either employed a complex (dynamical) representation of the storm surge with no explicit representation of flooding (operational storm surge models) or a dynamical representation of flooding with a simple (statistical) representation of the storm surge (e.g. insurance industry models). Neither of these approaches are able to predict accurately the time- and space-evolving characteristics of a storm surge flood, and the need for a more integrated model with dynamical inundation capabilities is advocated. James is using a robust storm surge and inundation model to provide detailed information about the flood depths and velocities experienced at three case study sites on the East Coast of England, namely Canvey Island, Great Yarmouth and Kingston-upon-Hull, for different storm forcing conditions and defence failure scenarios. His research will be of particular interest to the insurance industry, although many other potential applications exist, including disaster planning and management, coastal vulnerability assessment and decision support for integrated coastal zone management. James' work is part of a wider research project entitled Coastal Settlements at Risk. Annelise Hagan started her Ph.D. in October 2000. Following the ocean warming event of 1997-1998, mass coral bleaching and mortality occurred world-wide. Reefs of the western Indian Ocean were some of the worst affected, with live coral cover on the Seychelles Bank being reduced to <10%. The concept that frequency and intensity of El Niño events may be increasing due to 'Global Warming' exacerbates the need for further research. The two aims of this Ph.D. project are to assess time-scales involved in reef recovery and suggest possible origins of the re-colonising larvae. Permanent transects will be set up in the granitic Seychelles and the Line Intercept Transect method and quadrats will be used to quantify the substratum and benthos; live coral species, dead coral, algal species and rubble. Repeat surveys will be conducted to quantify coral recovery over time and underwater photography will be used for permanent visual records. Large-scale datasets of water circulation in the area will be analysed to suggest the origins of new recruits. If the knowledge of reef ecosystems can be expanded, specifically addressing recovery rates after bleaching, management strategies incorporating such data can be used to conserve this delicate ecosystem. This study will incorporate data from initial surveys made by the staff of the Shoals of Capricorn research programme. Paul Elsner is currently continuing his MPhil research which he started in October 1999. The aim of his research is a better understanding of tidal sedimentation dynamics at a Managed Realignment Pilot Project at Tollesbury/Blackwater Estuary. 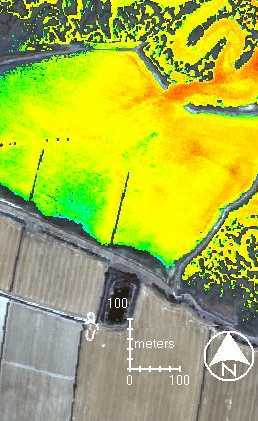 The methodological approach is based on the application of multispectral airborne Remote Sensing, using CASI and ATM sensors. The data is collected in high spatial (2m) and temporal (<10min) resolution and calibrated with concurrent ground measurements. It is hoped that the results will provide information for the better design of future managed realignment sites and also to further the methodological understanding of remote sensing applications in coastal research. The project is in close collaboration with the Section for Earth Observation of the Center for Ecology and Hydrology (CEH) in Monks Woods. This project was part of an ongoing, wider research programme designed to gain further understanding of estuarine processes with a particular view to re-creating more natural estuary morphologies, involving coastal re-alignment of flood defences as a method of estuarine management in areas of rising sea levels. The aims of his thesis were to provide quantitative information on wave and wave-driven processes within a macro-tidal, well-mixed estuary, and to show how such information may form part of more scientifically-informed estuarine management, particularly in the context of changing estuarine processes and morphological responses with sea level rise. Ecologists have viewed salt marshes as potential sources of organic nutrients for estuarine and coastal ecosystems through primary production, while earth sciences identify developing marshes as sinks of both allochtonous inorganic particulates and autochthonous organic material. Knowledge of the function of salt marshes with respect to organic material underpins the assessment of both the ecological value of marshes and their ability to survive present and future rates of relative sea-level rise. Recent research within both fields has examined the direction and magnitude of material exchanges by direct measurement of material fluxes on the flood and ebb limbs of individual tides. This work has revealed considerable complexity in the nature of material exchanges, implicating factors such as tidal range, marsh elevation, seasonal changes in primary productivity and storm surge incidence. A knowledge of the interaction of saltmarshes with incident wind waves aids the better understanding of ecological and geomorphological processes on coasts and has significance with respect to sea defence management. Previous field studies carried out over short time periods in micro-tidal environments, laboratory experiments using sea grass or kelp in a limited water depth range, and attempts to model the behavior of flow through vegetation analytically have provided only limited information on this subject and are of limited applicability to the macro-tidal environments of northern Europe. 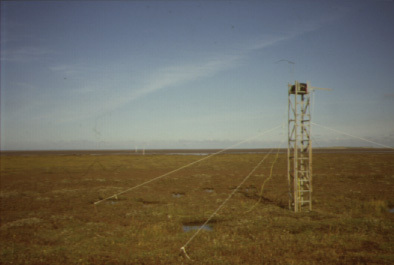 In this study, a combination of laboratory investigation, field study, and numerical modelling is used to provide quantitative estimates of wave attenuation at different spatial scales and over a wide range of tidal, wave and meteorological conditions encountered over macro-tidal saltmarsh surfaces. The information on the mechanisms by which intertidal flats and saltmarsh surfaces dissipate wave energy, and the efficiency with which they do so, places value on the role of saltmarshes as natural coastal defences, provides input into 'soft' engineering schemes for coastal defence, and contributes to the assessment of the ecological and geomorphological responses of marshes to sea-level rise on low-lying coasts. A critical investigation of the development of datasets describing global patterns of biodiversity for coral reefs and mangrove forests. Biodiversity patterns are firstly considered from the perspective of habitat distributions at the global level. New map-based datasets have been compiled, from which, statistical data describing the global coverage of mangrove forests and coral reefs have been derived. A second approach looks at global patterns from the perspective of taxa distribution, identifying hermatypic corals and mangrove trees. A detailed field example of meso-scale (1-100km) variation in coral reef fish communities is presented for two locations in the Central Indian Ocean. These studies not only illustrate the issues of gathering and analysing biodiversity from the field, but also make an important contribution to the existing literature on meso-scale coral reef biodiversity patterns, being the first such work to be undertaken in the Indian Ocean, and on isolated oceanic reefs.